Update your designs with the slick, on-trend 2018 Icon Starter Kit. Icons may be tiny, but they can have a big impact. A great icon can catch a person’s eye and stick with them. If you need the ideal icons for your next project or just want to give your existing projects a bit of a refresh, grab the 2018 Icon Starter Kit. It's on sale now for just $9.99 (approx. £7). The 2018 Icon Starter Kit is a great source for professionally-designed icons. You’ll find over 1,000 icons with modern themes and the flat design style that is popular with many designers. You can use these icons for any project you’re working on, with tons of styles to choose from. Grab icons with themes like Fintech, Internet of Things, cryptocurrencies, and more. 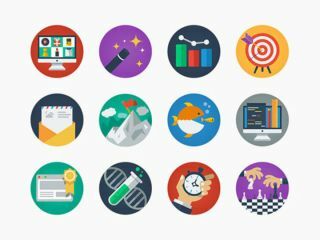 These icons are great for any project and will be sure to catch the eye of your users and visitors. You can get the 2018 Icon Starter Pack on sale for just $9.99 (approx. £7). That saves you 94% off the retail price. For any designer, it’s an offer that is too good to pass up, so grab this deal today. Scroll through the gallery below to see some of the icons included in this pack.